How can parents best teach their young adult children to manage their money well? Sam Runyan, a BYU School of Family Life student found that “practice makes perfect.” He interviewed 90 undergraduate students from various American universities, and found that, by enlarge, parents used experiential teaching to teach their children how to manage and spend money, how to work hard for their money, and how to become independent and self-reliant. He presented the results of his study at our college’s annual Fulton Conference, where he and his co-authors won first place for their department. He further described its universal importance :“Today, the millennial generation struggles to manage money as wisely as past generations. In our day, it can be easy to make foolish mistakes with our money. I believe it is important for people to learn how to avoid those mistakes so that they can financially take care of themselves and improve the lives of those around them.” He hopes that researchers, educators, and future parents will take his study’s results and and implement them in teaching their children about financial responsibility. How did your parents teach you financial responsibility? The deadline for the Fulton Conference poster submission is in two days! For information on why you should enter, if you haven’t already, go here. For instructions on how to make a poster, watch this video. For information about the prizes that will be awarded, go here. For information about what you need to do on the day of the conference, go here. There is perhaps no more unique an opportunity for us to support research that increases everyone’s collective ability to understand the world around us and to engage with the people around us, and to see what great work our undergraduate students are capable of, than at the annual Fulton Mentored Student Research Conference. This year’s conference is just around the corner, and promises to inform on topics such as internet addiction, adolescent romantic relationships and their relationship to depression, and parental school involvement and responsible children, and many others. The Mary Lou Fulton Endowed Chair in the College of Family, Home, and Social Sciences is pleased to host the 13th Annual Mentored Student Research Conference on Thursday, April 13, 2017. The conference will be held in the Wilkinson Student Center Ballroom from 9:00 a.m. – 12 p.m. and is open to the public. The conference will feature research done in the areas of neuroscience, sociology, social work, psychology, family life, geography, anthropology, history, political science, and economics. The conference is a unique opportunity for hundreds of graduate and undergraduate students to present their most recent research visually and succinctly. Parents and family members, students across the Y’s campus, and members of the community are invited. The College of Family, Home, and Social Sciences honors the life and contributions of Mary Lou Fulton by designating a chair in her name. Mary Lou was a wonderful example of a Latter-day Saint woman who, after devoted service raising her family, returned to college to finish her degree. Throughout her life, Mary Lou sought to help those with personal challenges, whether assisting her own students who struggled with reading or rendering quiet service to neighbors and ward members. During her lifetime, Mary Lou and her husband Ira supported causes and programs that uphold and strengthen the family unit. This goal continues to be a high priority for Ira, as well as helping others remain free of addictive substances or crippling afflictions that limit their possibilities in life. The Mary Lou Fulton Endowed Chair provides meaningful research and educational experiences for students, faculty, and children. Mary Lou’s passion for educating and elevating others is reflected in the many elements of the chair, established by her husband Ira A. Fulton in 2004 to honor and recognize her example. The Chair also funds internship grants, professorships, and young scholar awards. Many states, including Utah, often experience devastating wildfires. These disasters are especially prevalent during the hot, dry months of summer. While environmental restoration from these fires can be a lengthy process, could the landscape of the area increase the recovery rate? This inquiry was taken on in conjunction with our college’s recent Fulton Conference. The study was conducted by a team of geography students comprising of Alan Barth, Roxanna Hedges, Kevin Ricks, Ben Seipert, and Dr. Matt Bekker, their faculty mentor. Their research showed a positive correlation between an environment’s recovery rate and its vegetation and slope. The team chose to research the 2007 Salt Creek Fire in Utah’s Juab and Sanpete counties. This site allowed them to study both the effects of the slope aspect and the rates of the maple and scrub oak tree recovery compared to the juniper trees. The findings of this study could help ecologists to better understand the timeline and effectiveness of wildfire recovery. By furthering knowledge in this field, changes could be made to improve environmental recovery as well as potentially wildfire prevention. To learn more about wildfire prevention, go to the following website. Does Utah’s Poor Winter Air Quality Hurt School Attendance? Northern Utah’s unique geographical situation leads to periods of crippling inversion during certain times of the year, primarily the month of January. With this poor air quality causing many negative health effects, young children are frequently kept inside for recesses during times of inversion. But, could the inversion be affecting more than just recreation? What if the existence of inversions altered school attendance in general? Courtesy of Flickr Creative Commons. In conjunction with our college’s recent Fulton Conference, a team of economics students including Nicholas Hale, Ryan Allen, and John Cannon, researched this concept. Their research found a positive correlation between elementary school absences and air pollution. The team studied four different Utah school districts: Alpine, Provo, Salt Lake City, and Park City. Using Park City School District as a quasi-control district because of its higher elevation and subsequent lower exposure to poor air quality, they were able to track school attendance and then compare those numbers to the fluctuating inversion levels. Previous research showed that an increase in air pollution was associated with a 1.5 to two percent increase in elementary school absences. Researchers predicted that, during an inversion episode, the percentage of absences could triple to six percent or higher. Though this may sound like an unfavorable statistic, the research shows that air quality, and thus the correlated attendance levels, has actually been improving when compared with decades past. Women are Less likely to Take Risks. But Why? When was the last time you took a risk? Did you think long and hard about it – weighing all your options? Or was it a snap decision? Research shows that women are less likely to take risks than men. But the reason might be different than you think. Hal Miller, professor of Psychology at Brigham Young University, has developed a new method of experimentation to measure the human emotional response to gains and losses in risk-taking and decision making. He found that women’s brains react more intensely to perceived gains and losses. However, this does not mean that women are necessarily more emotional, but that a woman’s emotional reaction to a loss is, on average, greater than her emotional reaction to a gain, when compared to men’s reactions. 1.) Imagine that you and I bet 100 dollars on the flip of a coin. You guessed heads and you won. The 100 dollars is yours. Do you want to keep the money? Or should we go double or nothing? 2.) Now, let’s change the scenario. You and I bet 100 dollars and you guessed heads. Sorry pal, you lost. Now, do you want to accept the loss and walk away? Or do you want to go double or nothing? As humans, we dislike losing more than we like winning. That’s why the average person is more likely to try a double or nothing bet in scenario 2 than in scenario 1. In 2002, a man by the name of Daniel Kahneman won a Nobel prize for an explanation of this phenomenon, and how it applies to economics. It’s called prospect theory. In short, Kahneman concluded that we make decisions based on how we perceive our potential gains and losses. He also proved that we are more likely to avoid risks when there is a potential loss than when there is a potential gain. “We actually have a pretty good idea of the ratio…or by how much people hate losing more than they love winning,” said Kahneman. He estimated that it was somewhere between a 2:1 and a 3:1 ratio. Dr. Miller, through his new methods, has identified, via electroencephalogram (EEG) brain-wave technology, a more precise measurement of how much more we hate losing than we love winning. The average human ratio is 2:1, the reaction to a loss being greater. The difference between Kahneman and Dr. Miller’s experimentation is that Kahneman measured people’s cognitive decision-making. Miller’s experiments, however, are strictly behavioral. They only measure the behavior in relation to the emotions experienced. Are our Decisions More Determined than we Think? It is possible, then, that human risk-taking is more determined than we think it is. It is possible that our experiences and emotions govern our decisions more than we would like to admit. The implications of Dr. Miller’s findings are interesting to consider. The diagnoses of autism and anxiety by psychological clinicians may have a critical problem. 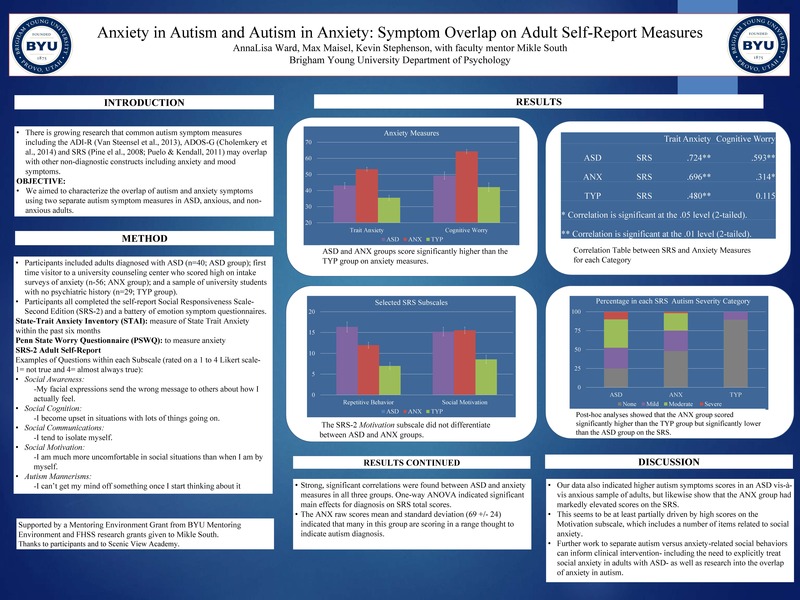 BYU students AnnaLisa Ward, Kevin Stephenson and Max Maisel have spotted a potential weakness in the measurement of autistic symptoms. Analyzing a common autism diagnostic test, the Social Responsive Scale (SRS), they found that it may misidentify symptoms of anxiety as indicators of autism. Their findings were presented at a recent research conference at BYU. The SRS is a survey given to psychiatric patients to differentiate symptoms of autism from symptoms of other disorders. Since people who live with autism often live with anxiety as well, it is sometimes difficult to differentiate between the two. But a diagnosis of anxiety does not necessarily mean a diagnosis of autism. Yet this study found that among people with high symptoms of anxiety, fifty percent of them actually score high enough on the SRS to be diagnosed with autism. Some even scored high enough to be categorized as “severely” autistic – even though they did not have autism. Their anxious symptoms could have been mistakenly accepted as indicators of autism. “So we see that there is likely a problem with the measure that we are using,” says Kevin Stephenson, a doctoral student in clinical psychology. “When using this test, clinicians may need to take a step back and ask, ‘Is this really autism or is this just anxiety?’ And the data we have provided will most likely lead to improvements on the diagnostic measurements.” The study is being prepared for publication. What Can WE Do to understand Mental Disorders? Studies like this can inform a “measure twice, cut once” mentality regarding the diagnosis of autism. The better the diagnostic tool for a mental issue, the higher the likelihood of a correct diagnosis, and the more effective the treatment for the afflicted person. Conversely, if the tool is not as finely tuned as it could be, then diagnoses might be difficult or faulty. Similarly, each of us need to develop a “measure twice, cut once” attitude in our associations with the mentally disabled. When we learn that someone has autism, anxiety, or depression, do we take the time to know what they experience before we jump to conclusions about how to help or associate with them? Being informed on these kind of mental issues, and how to best associate with people who have them, is essential to removing stigmas and improving the lives of effected individuals and their families. There are resources available in your community and all across the web. For more information on autism, visit AutismSpeaks.org or BYU’s: Autism Connect. Do you know someone with autism or anxiety disorder? How has that effected your understanding? Daddies or Dummies: Is the Media Teaching Our Youth to Disregard Dad? A new study reveals that the media may not only be portraying fathers negatively, but actually teaching youth to disrespect and disregard their dads. In an era where the role of dads is coming into question, these findings shed light on a possible widespread problem. 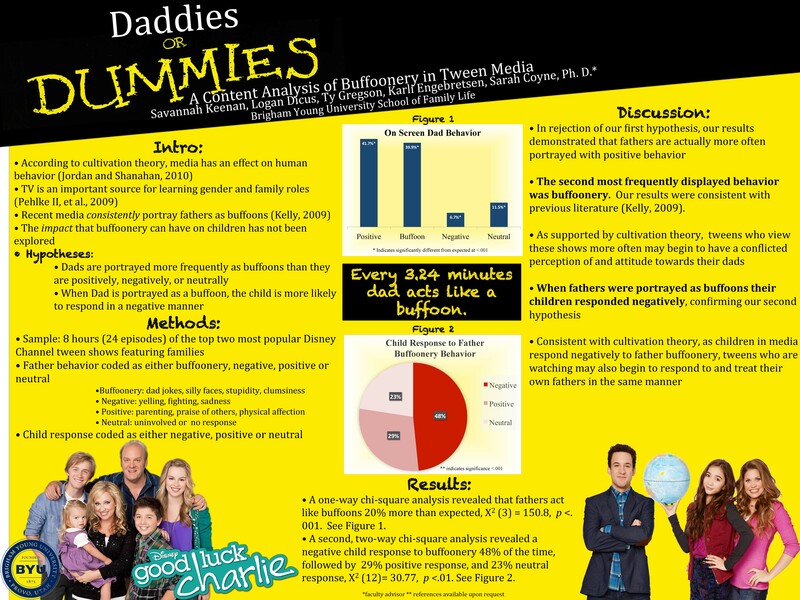 Savannah Keenan, recent winner of the college’s Fulton Conference in the category of Family Life at BYU, found that almost 40 percent of fatherly behavior on popular tween television shows like the Disney Channel’s Good Luck Charlie could be considered ridiculous or buffoonery. But what is truly eye opening is the on-screen response of children to their fathers. Fifty percent of it is negative. Does it Affect our Youth? Children tend to model behavior they see on the TV screen. The National Institutes of Health have documented this. So when a child sees this kind of anti-dad behavior on their favorite TV show, they may pick up cues from their child-actor counterparts, and eventually exhibit similar behavior. Further, their attitude toward the importance of dads may eventually turn sour as they learn from the television that it is okay to disrespect their father. Studies like those done by Keenan can inform the media of the negative consequences of portraying fathers in a negative light. And hopefully, future findings will encourage the media to produce even more positive content for youth and families. How does the media in YOUR home portray Fathers? How do your kids react? Is Religion the Reason for Low Contraceptive Use in Nepal? An estimated 225 million women today would choose to stop or delay childbearing, but are not using contraceptives. Why is this the case? Is it because they do not have access to them? Or because they are not allowed to make childbearing decisions for themselves? Answers to these question are essential to improving women’s autonomy and health across the globe. And a new study of Nepalese women shows that a more important factor than access to contraceptives may be religious attitudes towards them. Margo Andersen Taylor, an undergraduate student in the BYU Sociology Department, has gathered new evidence that has broken down old assumptions about women’s autonomy and contraceptive use in Nepal – a country with low contraceptive use. She presented her findings at our recent Fulton conference. It is often assumed that people in rural populations are less likely to use contraceptives because they do not have access to them. People who live on farms, for example, might not live close to a physician or a store where they could get “the pill” or a contraceptive device. However, Andersen’s newfound evidence suggests that being in a rural setting actually does not deter women who are allowed to make personal and/or household decisions from accessing contraceptives. In fact, the difference between urban dwellers’ use of contraceptives and rural dwellers’ is almost entirely negligible. Why Then, are Contraceptives Not Used? If women in rural settings are not likely to be kept from contraceptives, why are there so many Nepalese women who do not use them? This study, with a sample size of almost 10,000 Nepalese women, showed that autonomous women of the Hindu faith were more likely to use contraceptives than Buddhist women. 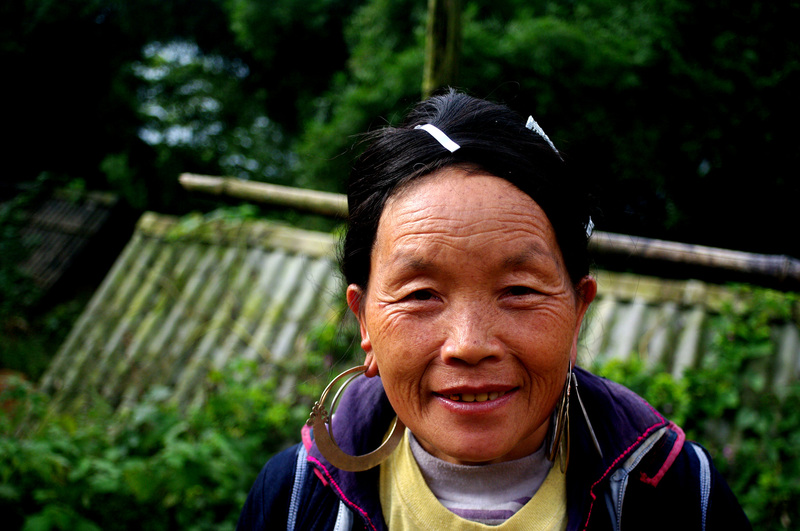 In fact, the most autonomous women of Buddhist affiliation were among the least likely to use contraceptives. According to this study in Nepal, when it comes to contraceptive use, it doesn’t seem to matter so much where you live, but what you believe. The government of Nepal is currently running a media campaign to inform its citizens about options for better family planni ng, directing most of these messages to people in urban settings. Their hope for change, however, is likely based on the false assumption that this urban-directed campaign will be most effective because urban populations have greater access to contraceptives. Andersen believes that it’s likely Nepal would have more success in achieving their goals of increased health and population control if they were to focus their campaigns on religious groups rather than regional populations. Her data is being prepared for publication that may help the government of Nepal to take a more effective approach in their endeavors to improve women’s autonomy and health. Andersen’s poster (seen below) won first place in the sociology category of the conference.